Hello Nosh Show listeners! Sorry for the late post as the day was a bit more hectic than I expected (plus I cheated and didnt post a review yesterday). The good news is that episode 82 is now available. Now I wish I could talk about those new Reese's stuffed with Pieces that Junk Food Guy covered today, but instead we're going to talk about something that hopefully you've seen although I haven't seen a ton of stores carry them yet. I am talking about Choco Chip Oreos. So of all the Nosh Show hosts, I wind up being the biggest fan of these new Oreos. No they don't taste exactly like a chocolate chip cookie, but these aren't just any cookie, they are still Oreos, so they still need to taste like Oreos too right? I guess I am in the minority on these. A lot of people seem to put these down while touting the awesomeness of the fruity crisp Oreos, but I never even finished the package of those, they were just way too sweet for me. Before we go, I must admit that I was tempted to lead this show's announcement with this nonsense. 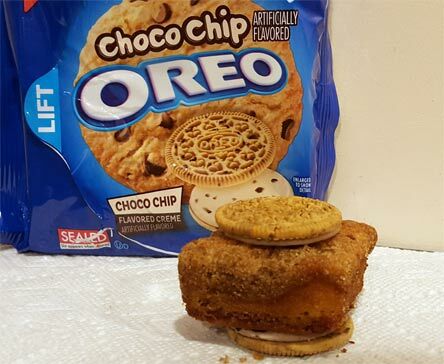 It's a Hostess coffee cake shoved inside two choco chip Oreos. Why? Iunno, why not? 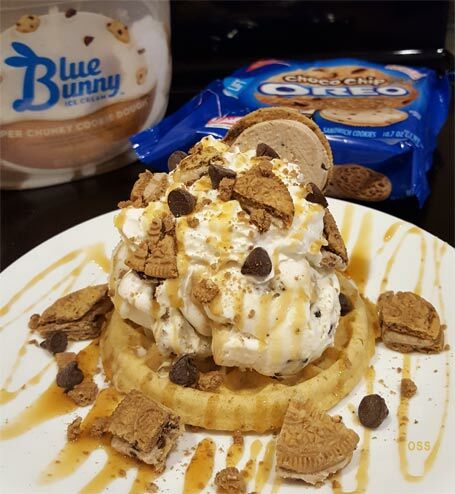 It actually worked surprisingly well because although we've got lot of sweetness from the Oreos, it pairs well with the cinnamon as well as the general cake flavor. I didn't have a second, but I enjoyed the first.... and my daughter just walked by and went "What?" I think it's safe to end on that note. Have a great week everyone. Try not to melt. Should have been a deep fried ice cream ball not a muffin. Blue Bunny Cookie Dough is DELICIOUS....it is in my top 5 BB flavors.